Moonshine Cove Publishing, LLC, 9781945181061, 356pp. "You must swear by Allah never to say a word of what I'm going to tell you. This is the most important secret. 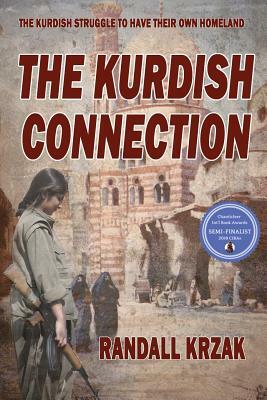 Ever "
"The Kurdish Connection--a compelling read. A story of friendship, danger and intrigue." --Ann Everett, Amazon Best Selling Author. ..". Randall's authentic voice adds a powerful push to keep a reader turning the pages." --Janet Taylor-Perry, author of The Raiford Chronicles, The Legend of Draconis Saga, and April Chastain Intrigues. "Topical - Engaging - Intriguing - Powerful ... A real page turner." --Rikon Gaites, author of Mummy's Little Soldier and Darius Odenkirk. ..". Randall Krzak brings his wealth of experience living in this troubled part of the world and his military knowledge to bear in this exciting story..."--John L. DeBoer, author of When the Reaper Comes. ..". a journey full of history, suspense, intrigue, and action...a MUST READ for all "--Les Stahl, Retired NSA Executive. ..". Readers need to fasten their seatbelts for a fast-paced tale made believable by a writer who knows what he's writing about." --Preston Holtry, author of the Morgan Westphal mystery series and the Arrius trilogy (forthcoming). "A behind the scenes story, ripped from today's headlines deepening the reader's understanding of an ancient strife ... filled with the sights and smells of the market place and secret meetings, the reader is admitted to the secret heart, the desperate longings of those that must fight and win, or see continued subjugation by their masters..."--Oliver F. Chase, author of Camelot Games, Levant Mirage, Blind Marsh, and Marsh Island.